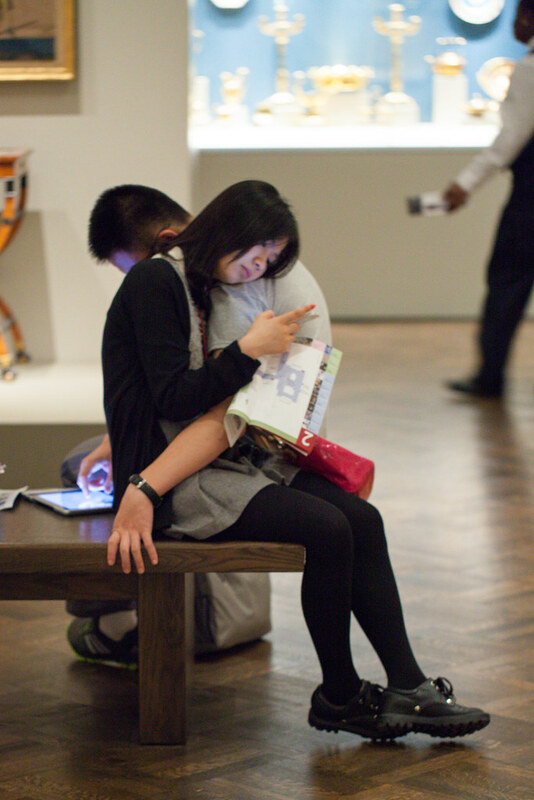 This photo of a couple intertwined on an art museum bench looking each of their own devices is quite curious. For one, they are in an art museum with plenty of artwork to look at, yet they choose to look at their digital devices. For two, they aren’t sharing the same device, they look at their own individual screen. Despite looking at their own screen, their bodies are intertwined together. Such a mix of digital consumption amidst traditional consumption with physical interaction. Sure, a sign of the times. Being attached to our screens. The caption for this photo even invents a new word “devicing.” However, is there a precedent for community devicing in our culture? In other cultures? We eat meals together. But traditionally it’s a meal shared. Consuming your own digital device is a bit like each person getting their own meal to consume. So perhaps digital screen consumption is like fast food restaurants. Everyone gets their own style burger in their own box. We read books together. It’s not so strange for a couple family members or friends to be in the same room and reading different books. So why would it be strange for people to be using their own digital device? Perhaps because there is no cover on the device that immediately says what each person is reading? But what is strange is devicing in an art museum. This couple’s actions transform what going to an art museum means. They have transformed the art museum into a cafe. What was once a place to go and contemplate the artworks on the wall, now becomes a place where the artwork is not even considered. The art is a mere backdrop for consuming what’s on your digital screen. It’s no wonder why art museum limit the number of benches in the galleries. Curators have long known that if they put too many sitting places in the museum, it’s no longer a museum. It’s a cafe. I saw a couple just like this at the art museum last week, too! I did find it strange that people would sit on the benches avoiding the art work in front of them.